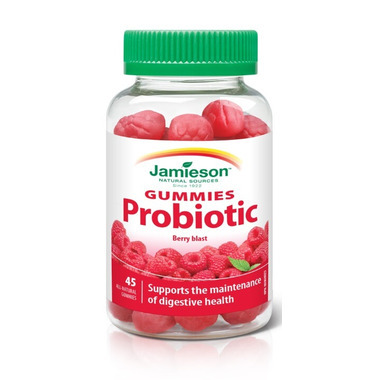 Jamieson Probiotic Gummies support your optimal digestive health. Directions – Adults, adolescents and children 3 years and older: Chew 1 gummy daily. Take a few hours before or after taking antibiotics or antifungals. Store between 15°C and 25°C, away from children. Also contains: Gelatin, glucose syrup, cane sugar, invert syrup, citric acid, sodium citrate, natural flavour (raspberry), natural colour, natural fruit juice (pineapple), starch, fractionated coconut oil, Brazilian palm tree wax. WARNING: Consult a health care practitioner prior to use if you have fever, vomiting, bloody diarrhea or severe abdominal pain. If symptoms of digestive upset (e.g. diarrhea) occur, worsen, or persist beyond 3 days, discontinue use and consult a health care practitioner. Do not use this product if you have an immune-compromised condition (e.g. AIDS, lymphoma, patients undergoing long-term corticosteroid treatment). My daughter takes these and seems very happy with them. She said she feels like she digests her food better and her stomach feels better since she has been taking them. She is 21. Too sweet for me but does the trick. Delicious! And, everyone in the family enjoys taking them. These make taking probiotics so much easier. I take them daily (not a kid) and really love them. Have been taking them for the past few months and they seem to really help with digestion! Great for young children but they tend to get hard before the bottle is done. My son still loves them. Kids love these, helpful when they arenâ€™t old enough to swallow. Iâ€™ll buy again. These vitamin gummies are great. My son takes them daily without complaint. These probiotics gummies are ones to take. The taste is not to berry and they work well. My son loves them and takes them without a hassle every morning! These gummies are perfect! They taste exactly like Sweedish Berries so an easy sell for anyone who has difficulty swallowing pills. My 8 yo daughter had a problem with bad breath. Her dentist said she had perfect oral health, so it was likely that the problem was in her digestive system. He recommended probiotics as a treatment. It works! After taking probiotics for a few days, the bad breath problem stopped. We've tried different brands of probiotics, they are all effective, but these gummies are the best, since they taste so yummy and the price is reasonable. My son LOVES these gummies! They taste great and help keep his digestive track healthy and regular. Yummy! Great for kids too. Good tasting chews! My son likes the taste, too! Delicious way to take a probiotic! They are my favourite! They are definitely a nice break from taking probiotics in a pill form. The best way to get probiotics into my kids for sure...and they do taste like swedish berries! Not sure if they are as effective as the ones i take, but at least i can get it in them! yum, yum, like other reviewers very tasty, also not sure what they are doing but feel it can not hurt, i do feel i do have as many tummy issues, same with my daughter who also takes them, have purchased before at a different store and they were all stuck together this batch is not doing that, so maybe fresher not sure, but do feel they are helping somewhat, and good price on sale. They taste just like a Swedish berry. For all I know they could simply be a bottle of Swedish berries. In terms of what to expect from a probiotic product, I have no idea. Then again, I have no idea whether any of the supplements I take are actually doing anything. Does anyone? If you bought these for kids they will be a hit, in fact, you'd have to hide or lock them up. They taste good, that's for sure. It's my first time taking probiotics so I'm not sure if they're more/ as effective as other kinds. Whoever came up with the idea of probiotic gummies is a genius! No water? No worries! My 8 yr old, who is picky about these things, likes the taste.